Thanks to Karen Varian for generously writing the majority of the information on this village contained in these pages. L’uta is currently located in the Velikyj Bereznyj Region of the Zakarpatska Oblast, Ukraine. It is north and a little east of Uzhorod. From Uzhorod you ride through the cities of Perecyn and Velikyj Bereznyj. The village length is 12km, on which 1,040 houses are arranged. In 1980 the population was 3,105. The village is situated in the L’utanka river valley. 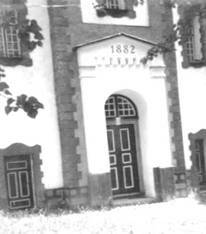 Since 1711 L’uta has belonged to the Uzhorod dominion. L’uta is tucked nicely into a ravine almost too small to call a valley. There are fields on the sides of the mountains with creek running along the village. L'uta is only about 1 house deep on each side, and is 14 kilometers long. We weaved our way into town through cows and people walking their cows. 56 Magyar, 109 German, 2771 Rusyn; 2796 Greek Catholic, 116 Jewish. The first written reference to the village is from 1599. L’uta is the Old Slavonic village name and means “snowy side”, “cold region”. 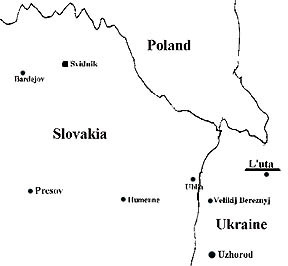 Czech administration came to the village at the beginning of 1919 as the Czechoslovak government’s representative in this area. L’uta was the center of the partisan resistance movement in the western Zakarpatska region during the Second World War. 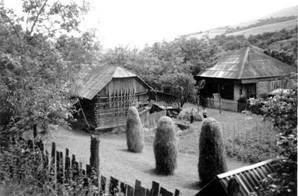 Beyond the village are mineral springs and extensive poloniny – mountain meadows. Several legends exist in connection with the village name. One of them says that a long time ago people from the other side of the Carpathians fled from Crimean Tartar attacks into this valley. They settled here, but because of great frosts many of them died. Therefore the village was called the name L’uta (“Regret”). As described by a recent visitor, Preston Benchley, who was in the Ukraine adopting a child and took a trip to his ancestral village of L’uta. We stopped and Vladimir our translator popped out and said he was with some "Americankas looking for his Cihunka and Dranchak relatives here in L’uta. A cute little babushka offered to take us to our first house down the road...a Dranchak. We got out and this cute old lady went in summoning in Ukrainian (editor’s note: they speak Rusin in this village) for another babushka. This cute little babushka came out and we told her My Great Grandmother Helen or (Olena) Dranchak was from this village. She was pretty old and it looked like she didn't understand Vladimir our translator (editor’s note: she may not have understood because she spoke Rusin and the driver probably spoke a dialect of Ukrainian that she did not understand well). She said she was Olena Dranchak. Then the babushka who lead us here started yammering away loudly in her native tongue and she caught on that my great babushka was Olena Dranchak. She then got excited and said that was her aunt and that her father Yuri Dranchak was, Olena's brother! We were talking with my Grandma Anne Kormylo's first Cousin! This first cousin of Grandma Anne's told us she had never married. She was born in L’uta in 27 August 1925. She had two siblings, Ivan who still lives in L’uta, and Anastasia who lives in Mezhghirdia (spelling? ), Ukraine. Olena told us her father Yuri Dranchak was born and died in L’uta. Her mother's name was Olena Gretza. Olena Gretza was born in L’uta and died in L’uta when her daughter Olena Dranchak, was just a small baby. That was all the family history she could remember. She did tell us that last year a group of people came and she helped them do family research on the Dranchak side so maybe there is some current link ups out there on the family tree? She said they promised to send her some money and never did. I felt a little bad for her and probably should have given her some money, but we had a pretty big audience of townspeople and it didn't feel right. We did buy Ukraine’s best chocolates to bring to people and she was pretty excited to get a box. We took video and pictures of her and hugged and kissed each other. She was very sweet and it was the coolest talking to one of Grandma Kormylo's cousins! Olena and our fabulous town guide talked more and mention going to another house to visit a son of Vasil Cihunka "the one who went to America". We were really excited! We departed and drove down the street to visit Nikoli Feodervitch Karmentsa. We got out of the car and walked up to meet Nikoli Karmentsa, and I told Vladimir to tell him "Vasil Cihunka was my Great Dedushka". He immediately smiled and said that was his uncle that went to America. He said his mother was Yvah Cihunka (Grandma Anne's Aunt). Jackpot! That was quick cut to the chase and the fastest yet that we had established our family link up. We shook hands and hugged and I could not believe that I was blessed enough to find not one but two of Grandma Anne's first cousins in L’uta is such a short amount of time! I wish I could express my words, and I so wished Grandma and my mom were with me! Anyway Nikoli was the poorest relative we were to meet on this trip. I felt so bad that they lived in such humble conditions while I live so comfortably. Nikoli invited us into his one room house attached to the barn. It was about a 10 X 10 room with a wood stove, 2 chair and tiny table, an old bed that doubled for a couch when we were there, and their clothes hung up on the wall. The floor was wood and in bad shape. Nikoli's pants were too small and shirt was in bad shape. It was real humble. Nikoli was married and in my rush, I forgot to write down her name. That is my first task to find out, when I write them. They live with their son Vasil Karmentsa and his wife Svetlana. 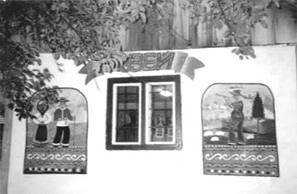 They live in the house on the property that looked like at typical house in L’uta. Vasil had one brother, Nikoli who lives in Uzhorod. Once we were inside Nikoli's little home, we began working him for information. He was quite old, partially blind and really did a good job racking his brain for information. We had established that his mother was Yvah (Eve) Cihunka at the beginning of the visit. His father was Feodor Karmentsa. Fedor Karmentsa's father was Petroa Karmentsa. On the Cihunka side he said his mother Yvah had a brother Mikiel (pronounced mik-heil). He said also that his Grandfather and my Great Great Grandfather Gabriel Cihunka had a brother named Yuri. 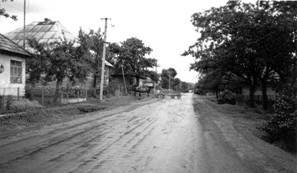 Yuri had a son born in 1914 who lives in Dubrincy, Ukraine. He couldn't remember his name, but obviously a Cihunka who is up there in years. Next he told us about his 15 brothers and sisters....yes, I said 15. I don't know if the order he gave them to us is the order of age, but here they are: Hafia, Yveh, Hannah, Stanko, Yuri, Maria and Maria. I know, I verified there were two Maria's maybe they really liked that name? (Editor’s note: it was common for them to reuse the first name of a child after that child died) By this time Nikoli's son Vasil had raced up from the creek where he was swimming with his daughter. His wife Svetlana raced down to the creek to get him when she heard who we were. He came crashing in all wet still in his speedo. Anyway they all confirmed these names and helped him work his memory. Anna. Died near Uzkavkah which is near Uzhorod. Nastia. Died. Olena. Lives in L’uta. Imagine that! Another one of Grandma Anne's cousins named Olena that lives in Luta. That is only ten kids, but he couldn't remember the other five. (editor’s note: I had the same experience with all the Olena’s). We had worked Nikoli's memory to the breaking point. They had a stack of old photographs, and upon inquiry we learned none were real gems like pictures of Cihunka parents or Grandparents, they led us to believe they were all Karmentsa pictures. We went outside and took more pictures and video of them. We gave them a box of the nice chocolates we had brought and a Ben Franklin to fix up their place a little. We started to walk to the car and then there was a little commotion, Nikoli's wife ran into the house with Svetlana and Vasil told us to wait a minute, that they had something for us. I am not trying to brag or highlight the fact we gave them what they thought was a lot of money, but to give you an idea, the 100 bucks we laid on them was probably at least a year, maybe 18 months income for old Nikoli. The pensions there since the fall of the Soviet Union has been cut to something almost as pathetic as an American saying he is going to retire on his social security only. I think they were overwhelmed with the gift. We are waiting by the car saying goodbye to Nikoli and then Vasil comes tearing around the corner with mother and wife in trace with a bag to give us. They pulled it out and excitedly told us it was an old dress outfit with all the fancy embroidery on it. It was gorgeous. When they told us it was Nikoli's wife’s GRANDMOTHERS we kept saying nyet, nyet that it was too generous. They were giving us something that was well over a hundred years old and was in fantastic condition! They wouldn't say no. It was like trying to give money back to Grandma Kormylo...it's not going to happen without getting a black eye. We were so touched that these people with almost no possessions would give us something they treasured so much! Tears just run every time I think of this sweet gift. We hugged them all and then got in the taxi and drove way. Yelling "shesh leavo" (good luck) and "dopobachenya" (goodbye). I was in awe at the experience we had just had. It made me realize that nobody throws down the welcome mat for family like they do. I understood now the roots of where my mother and grandmother got that trait from of stuffing your belly and sending you home with half of the refrigerator and the shirt off their back to anyone who came over. I really felt a lot of love from these good people. On the way out of town we stopped by the L’uta church to check it out, and the cemetery that was there. The catholic priest (editors note: the church is Orthodox under the Orthodox Church of Russia) let us in and we took some video of it. It had been refurbished 10 years ago, but I was lead to understand the inside was still original. So our ancestors likely went to mass there years ago (editor’s note: it was a Greek Catholic Church before communism). We asked about church records and the priest told us the Germans destroyed them in World War II. We only had a few minutes so we just took video of the cemetery. The older ladies of the town, our guide's friends all said the cemetery "had been plowed or flooded over three times...very difficult to find anything". That may be a translation error from Vladimir, I can't see a dumb farmer on a horse doing that, so I think it may have been bombed in during a war or something. They also mentioned floods, so maybe some of it got washed away? We came down the hill from the church, gave our sweet little old tour guide a box of chocolates and then were adamantly persuaded to come with this enthusiastic gentleman to come and see the L’uta museum. I laughed, and you would too after seeing how small L’uta is, that he said he had a great museum. We spent about 15 minutes there. We signed his registry and saw Karen Varian's name there from her visit. It had mostly ancient L’uta clothing and domestic things like a weaver machine, some household thing from the 1800s to 1900s. It was cool and we were glad we went. We saw a dress that looked exactly like the one we had just been given by the Karmentsa's labeled year 1900. He somehow ran like the wind to his house and then came with his wife racing up with their daughters with 2 big plates full of cookies and pieces of cake from a wedding they had just had in L’uta the night before. I was excited to see some cookies my mom made every Christmas, Russian Teacakes! I was feeling right at home with my people and wished I could stay there a week. We said dopobachenya, and weaved our way again between cows and babushka's walking the cows, as we drove out of L'uta. I was sad to leave. The visit made such a huge impression on me that I will never forget it. It is hard to describe, but it actually felt like home even though I had never been there. My relatives had lived there from at least the 1850's and perhaps even later and I felt so blessed to be able to go there. Perhaps the most characteristic feature of Rusin folk costumes is their embroidery. Regardless of village, every Rusin folk costume uses some type of embroidery as its ornamentation, with particular patterns used in particular regions. One familiar with Rusin embroidery can look at the pattern on a man’s shirt or the trim of a woman’s skirt and know what region or county the costume comes from. Characteristic to the village of L’uta and the Velikyj Bereznyj District is the flowered embroidery found in their costumes as well as their embroidered linens and scarves. 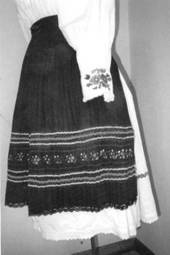 The traditional woman’s folk costume of the village of L'uta includes a woman’s shirt of white cloth. The shirt reaches the thigh, with a heavier half-slip of hemp-cloth attached, reaching to the knees. 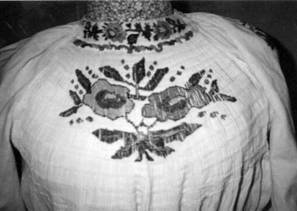 The front of the shirt is finely smocked, with embroidery in straight lines along the gathers forming a flower design. The shirt is finished at the top with an embroidered neckband. The sleeves are gathered at the wrist with a cuff and an added crochet band for finishing. The same flower pattern is repeated on the cuff and the shoulder. The skirt is made from five widths of white fabric. Four widths are finely gathered, and the fifth – the front is left smooth. The portion of the skirt made from the four gathered widths is embroidered at the knee trimmed with borders of tucks. Along the hem of the skirt there is a crocheted finish. The front of the skirt, the smooth width of the fabric, is usually not embroidered. The apron is always part of a Rusin costume. This costume has a black finely pleated apron that is a bit shorter than the skirt. This pleated apron is similar to that of the Lemko Rusins. It has a row of embroidery at about knee length that is bordered by rows of colorful rickrack and wavy stitches. The hem is trimmed with a crocheted edge. The pleats are made by first dampening the cloth, then folding it into fine pleats, tying and leaving it to dry. At the waist is a sash woven from red wool yarn. The sash is wrapped around the waist twice. Unmarried young women tie it at the front, the married ones at the back. The following was written by Ann Sachko Grapp in about 1937/1938 when she was 12 years old. In it she describes her American Rusin home and family. I live in a rather large house located about in the middle of the block of University and 25th. The address is 2534 University Ave. N.E. (Minneapolis, MN). In our house we have four large rooms including a bathroom. Our furniture is simple. We have both electricity and gas. We have a large basement, which services many purposes. On one side we have a furnace, my mother does her washing there, my sisters use a cart to play in, and my brothers work there with their tools. We have both a large back and front yard. In the back we plant vegetables and have a number of fruit trees. I also have my flower garden there. We take great pride and care of our lawn because it adds beauty to our house. Each member of our family (the children) has been born and reared in it so it really is a part of us. 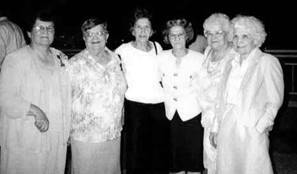 The members of our family today are my mother, dad, Mary, John, Peter, Helen, Susie, Irene, Catherine, and I. We are very thankful to own our home and have the pleasure and comfort in it. My mother’s home of today is so different from the one she was born in. Her home was in a little town called Ljuta of Czechoslovakia (now in the Ukraine). It had one large room, which served every purpose. The house furnishings were very simple. A huge stove made of clay was at one end of the room, which heated the house and cooked the meals. Their beds were on one side of the room, made of straw, which was hard and uncomfortable to sleep on. A hole dug in the ground was used as a storeroom in which they stored their food and grain. Their floor was made of hard clay that was covered with straw. In my mothers family there are two girls and six boys. My mother is the only one of her family who was fortunate enough to come to America. The rest are still in Czechoslovakia (today Ukraine). The school that she attended is similar to our public schools. The school lasted six hours a day, and the teacher was highly trained and a well educated person that was capable of teaching as much as five hundred students a day. Because my mother was one of the oldest in her family and of great help at home she had very little education. She started school at seven and was forced to leave school at nine. While at school she learned to read and write in her language. My mother’s marriage occurred in her hometown at the age of 18. Before and after her marriage she had to toil in the fields and in her house the livelong day. It was then a custom for the women to do the same kind of work as the men. Ten years after her marriage she came to the United States. She likes the United States so that she never wants to live in Europe again. She has now been in the United States for 18 years. My mother now is getting old and weak but she still toils and strives for us (her family) the livelong day. She wants us all to have a good education so that in some way or other we may be able to show our worth to the world. My father’s home was about two blocks from my mothers (in Ljuta). His home and customs were similar to my mothers. He loved to linger in the woods and see the different animals and hear the lustrous songs of the birds. In my father’s family there are six girls and two boys. He also in the only one that lives in the United States. My father attended the same school that my mother did. He went to school for eight years. The subjects that he had were reading, writing and arithmetic. After leaving school he served in the army for two years. He married my mother at the age of 23 years. They lived together for 3 months before he departed for America (without her). My father stayed in St. Clair (Pennsylvania) for a year, working in the coalmines. He then came to Minneapolis and worked at Soo Line (railroad). He still works for the same company. He is one of all of them who have been unfortunate and unemployed for nearly 9 months. When my father first came to Minnesota the wages were very low, but he saved in every way he could, so he could send for my mother. After 10 years he saved enough money for my mother’s trip. He sent for her than and my mother came immediately to America. My father now is 52 years old and his hair is beginning to turn to silver. He is worried because he has been unemployed for nearly nine months and things are beginning to be scarce. My mother and father have endured many hardships, but they still have hope. Mary who is the oldest of the family is very skillful with her hands. She is very good at sewing and setting hair. I am very proud of her. John is the oldest boy and second of the oldest in the family. He is full of mischief and always getting into trouble. From 7b to 9b he’s been in my class. He’s a big nuisance at home. I am very found of my brother Peter. He is the fourth in the family. He’s full of fun and skill with his hands. He is interested in crystal sets and spends much of his leisure time working on them. Among my brothers I like him the most. He is very helpful at home and us two get a long the best. Helen is next after Peter. She dreads to work and gets stubborn at times. She helps at home, but not very often. Susie who now is in the 5th grade is very pleasing. She seems to be getting along nicely with everyone. She is a good singer and tap dancer. Irene seems to be like a baby she’s always crying. She too is a good singer and tap dancer. Catherine who now is the baby of the family is always being petted. She seems to be getting on my nerves. The people that know her are very found of her. My deceased brother William was a member of our family for eleven months. Then came a day when the lord called for our beloved one. From the day of his birth to the day of his death we have loved and cared for him. His birth was Dec. 21, 1935. He died Nov. 3, 1936. Note: Ann is the third oldest. All siblings except for John are still alive today. My mother Mary Sachko Joseph is the oldest in her family. After my father died at a young age we lived with my grandparents (the mother and father Ann writes about in her article). 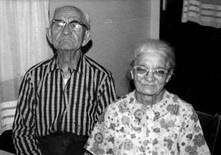 I thought I would share a few memoirs of my grandparents. She lived in the same house on University Ave. all the while she lived in the United States. She worked hard all day washing, cooking, cleaning and tending to the garden. She did not speak very much English. She spoke to me in Rusin and I responded in English and we understood each other just fine. She spent most of her time at home. She went to Church every Sunday and holyday. She always wore a dress with a full apron. I remember the food she cooked – holubki, mashed potatoes with cheese and onions, perohi, apple cake, potato pancakes, mushanka etc..
My mother told me that my grandmother would never wear red or pink because it was a tradition that married women never wore red. My grandmother talked some about her life in the old country. My grandfather left for the United States 3 months after they were married in 1911. As was tradition, my grandmother lived with her husband’s parents. After my grandfather left for the United States the First World War broke out. Times were hard and there was little communication with the United States during those times. My grandfather’s family thought they might not hear from him again so my grandmother moved back with her family until the end of the war and my grandfather sent for her. My grandmother came to the United States in 1920 by way of Canada. They were married and separated by war for 9 years. My grandmother always gave each of the grandchildren a dollar on their birthday. She also sent her youngest brother, Michael who was 10 years old when she left L’uta, a dollar on his birthday. When we meet Michael for the first time in 1994 one of the first things he said was he remembered that his sister sent him a dollar from Minneapolis. When you get married always keep a little money for yourself and don’t tell anyone. You don’t do housework on Sunday – no ironing, washing clothes etc. - He chewed snuff and had a spittoon next to the bed and the couch. - He would bundle up the week’s garbage so neatly in a 1/2-gallon milk container. - My newspapers for the paper sales at school were the neatest bundles. All stacked and tied tight. - He had to eat supper at 5:00 every day. - He went to church (St. John’s Byzantine Greek Catholic Church) every Sunday but did not sit with my grandmother. The women sat on one side and the men on the other. - He had his little corner in the house with a swivel chair and his razor strap next to the window looking out onto the back yard. - He hid (everyone knew they were there) a bottle of liquor in a specially made little cupboard in the pantry and out in the garage. - He spoke more English than my grandmother. He went to school to learn English when he came to the United States. - He liked to read newspapers (especially some of the Rusin language papers) and believed strongly in education. - His favorite TV shows were Red Skelton and Jackie Gleason. Currently researched by Karen Varian.